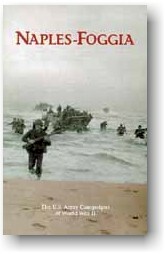 This brochure was prepared in the U.S. Army Center of Military History by Col. Kenneth V. Smith. I hope this absorbing account of that period will enhance your appreciation of American achievements during World War II. President Franklin D. Roosevelt and Prime Minister Winston S. Churchill had met at Casablanca in January 1943 to discuss global strategy. Despite continued support for the "Germany-first" policy adopted at the December 1941 Arcadia Conference, agreement on how to achieve that goal was far from unanimous. Churchill urged expansion of Allied operations in the Mediterranean. Roosevelt wanted to undertake the massive buildup of men and equipment needed for the cross-Channel invasion of France. Soviet leader Joseph Stalin, preoccupied with the battle for Stalingrad, was demanding immediate military initiatives to draw German forces out of Russia. Thus for political, strategic, operational, and logistical reasons, the Allied leaders at Casablanca agreed to invade Sicily (Operation HUSKY) in order to secure Mediterranean lines of communications and resupply, divert German forces from the Russian front, and drive Italy out of the war. Operation HUSKY and their commitment to drive Italy from the war. The Combined Chiefs of Staff directed General Dwight D. Eisenhower, commanding Allied forces in the Mediterranean, to prepare options for continuing the war in southern Europe after overrunning Sicily. Eisenhower's staff considered three primary courses of action. U.S. planners wanted to move from Sicily through Corsica and Sardinia into southern France. This option would support the cross-Channel invasion by engaging Axis forces in southern France, but might not drive Italy out of the war. British planners favored a thrust through Italy into the Adriatic area to support partisans in the Balkans, bring Turkey into the war on the Allied side, and shorten the lend-lease route to Russia. The third option, a thrust up the Italian peninsula, would tie down German forces, provide airfields for attacks on Germany and the Balkans, and probably force Italy out of the war. The latter course would remove twenty-nine Italian divisions from the Balkans and five from France, thus requiring Germany to provide troops to replace the Italian garrison divisions. The visit of Churchill and Army Chief of Staff General George C. Marshall to Eisenhower late in May eliminated the Adriatic option. With a final decision delayed, Eisenhower designated two separate headquarters to work on plans for operations after Sicily. One was to plan for an invasion of the Italian mainland, the other for an invasion of Sardinia. The invasion of Sicily on 10 July exceeded the Allies' most optimistic expectations. Their forces suffered lighter than expected casualties and made significant progress in the first week of the campaign. On the basis of Allied successes and reports of the Italian Army's disintegration, General Marshall on 16 July proposed a bold initiative to seize the port of Naples and the airfields at Foggia, some fifty miles northeast, followed by a drive on Rome. The concept was codenamed AVALANCHE. Fifth Army would execute Operation AVALANCHE, an amphibious landing near Naples. Although Marshall had suggested Naples as the assault site because of its port facilities, AVALANCHE planners had to look elsewhere. A primary consideration was the range of Allied fighter aircraft, which could not operate effectively over Naples because of the distance from their Sicilian bases. Additionally, the beaches near Naples were unsuitable for landing operations. The adjacent terrain, particularly the slopes of Mount Vesuvius, dominated the shore, and heavily fortified positions blocked routes inland. As an alternative, planners selected the Salerno area. Some fifty miles south of Naples, Salerno had a twenty-mile stretch of beach, favorable landing gradients, and numerous exits to the main coastal highway linking Salerno to Naples and Rome. The Salerno site also had some drawbacks. 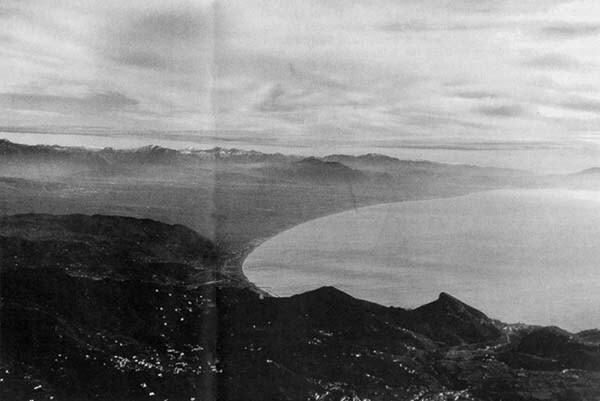 The mountains surrounding the Salerno plain would limit the depth of the initial beachhead and expose the invading troops to enemy observation, fire, and attack from higher ground. The steep vertical banks of the Sele River, which divides the plain into two sectors, would require assault forces to bring ashore bridging equipment to link the forces on either side of the river. Nevertheless, Salerno was within range of Allied fighter aircraft based in Sicily, and Salerno's Montecorvino airfield, when captured, could sustain four fighter squadrons. Additionally, compared to the Naples area, Salerno was lightly defended. While the Allies were planning AVALANCHE, Hitler gave Field Marshal Albert Kesselring responsibility for defending southern Italy. Kesselring, an Italophile, believed that Italy would refuse demands for an unconditional surrender, and he expected to fight a delaying action with his Italian allies until he could establish a permanent defensive line in the Apennines north of Rome. Hitler also developed plans in case Italy deserted the Axis coalition. In such a situation, Field Marshal Erwin Rommel, responsible for the defense of northern Italy, was to occupy all important mountain passes, roads, and railroads and disarm the Italians. Kesselring was to disarm the Italians in the south and continue withdrawing north. Kesselring and Rommel would remain coequal commanders, each responsible for his own sector, under the German High Command, until Kesselring moved into Rommel's area. when Allied forces failed to disrupt their retreat. They increased German defensive strength on the Italian mainland significantly. The German Tenth Army, commanded by General Heinrich von Vietinghoff, was established on 8 August to facilitate Kesselring's control of operations. Its 45,000 men had the mission of defending the heel of Italy and evacuating Calabria (the toe) when the Allies attacked. In conjunction with the Italian Seventh Army, Vietinghoff had three German divisions to hold the Naples-Salerno area and secure routes of withdrawal to Rome. The Hermann Goering Division was on the Naples plain, the 15th Panzer Grenadier Division was to its north, and the 16th Panzer Division had responsibility for defending the Salerno area to the south. In the early morning hours of 9 September, the approximately 450 ships of Operation AVALANCHE assembled off the Salerno coast. Elements had sailed from Sicily and from Tripoli, Oran, and Bizerte in North Africa, some as early as 5 and 6 September. German aircraft had attacked part of the fleet, so Kesselring knew that an Allied assault force was assembling but was uncertain where the blow would fall. German units were on alert, but were unable to defend all possible invasion sites. from the north. Once the British 10 Corps was reinforced by the British 7th Armoured Division beginning on D plus 5, McCreery's corps would swing north and advance toward Naples. Maj. Gen. Ernest N. Harmon, would come ashore through Naples, which Clark believed would be in Allied hands by D plus 13, or 23 September. The U.S. 82d Airborne Division, commanded by Maj. Gen. Matthew Ridgway, was to be held in reserve on Sicily. Plans to drop the 82d as a diversion along the Volturno River, sixty miles north of Salerno, and on Rome, had been canceled. Eventually Clark's Fifth Army would link up with Montgomery's British Eighth Army advancing from BAYTOWN. The amphibious assault began early on the morning of 9 September 1943. U.S. Rangers hit the beach unopposed at 0310, twenty minutes in advance of the main assault force, and moved quickly inland to seize their objectives. British Commandos captured the town of Salerno against light opposition. The British 10 Corps landed under a heavy naval bombardment, meeting significant opposition as its soldiers fought their way inland. The untested men of the U.S. 36th Infantry Division came ashore at 0330 without supporting fire, hoping to surprise the Germans. Although the leading elements took heavy casualties, all six waves of the 36th Division assault element were on the beach by 0610. Two companies of German infantry that had been on the Salerno beach judiciously withdrew inland as the assault began. Nevertheless, the Americans encountered small but intense resistance as they fought their way off the beaches. killed the gunners and then turned the weapon on the enemy. For his heroic actions Sergeant Logan was awarded the Medal of Honor. Small-scale and seemingly disorganized German counterattacks continued throughout the day but were repulsed as Fifth Army strengthened its lodgment. Reinforcements, support troops, and supplies poured ashore. By nightfall, the British 10 Corps was three miles inland and had advanced to the Montecorvino airfield. On the right, the U.S. VI Corps, which had met only limited opposition after leaving the beach, was some five miles inland. Separated by the Sele River, each corps operated independently with only minimal contact. But despite the fact that the landing force was in four separated beachheads, by dusk of D-day the situation looked favorable for the Allies. he directed General Vietinghoff to contain the beachhead. Vietinghoff, in turn, directed the 16th Panzer Division to prevent any deep Allied penetration until reinforcements arrived. On 10 September he concentrated the 16th Panzer Division against the British 10 Corps, blocking its progress while awaiting the arrival of LXXVI Corps. At first, Vietinghoff was optimistic, believing he could push the invasion force into the sea. Eighth Army was still 120 miles to the south and-had to traverse difficult terrain to reach the beachhead. Coincidentally, General Montgomery had decided on 9 September to halt his advance for two days to rest and resupply his forces, buying more time for the German counterattacks at Salerno. Meanwhile General Clark, who had yet to establish his headquarters ashore, was concerned because of the sketchy reports from the beachhead on D-day. General Dawley went ashore at 1300 and soon after began preparing to assume command of the VI Corps troops in the beachhead, earlier than originally scheduled. Elements of the U.S. 45th Division were also sent ashore during the night of 9 September to reinforce the 36th Division. Over the next two days, the 36th Division was able to consolidate its position ashore and expand the beachhead because of the withdrawal of most of the Germans in front of the VI Corps. However, in the British 10 Corps sector, intense fighting occurred as squads, platoons, and companies engaged in fierce exchanges with stubborn pockets of Germans who halted British advances and launched limited counterattacks. On 10 September Clark visited both corps. Progress was satisfactory in the VI Corps sector, but the resistance in front of the British and the separation between the two Allied corps concerned him. Frustrated with the apparent stalemate, Clark narrowed the British 10 Corps zone of responsibility which would eventually allow an attack north toward Naples. This realignment necessitated moving the U.S. VI Corps' boundary four miles to the north and assigning two regiments of the 45th Division responsibility for the added zone. On 12 September Clark moved his own headquarters ashore. The Germans rapidly reinforced the battle area, and the Allied situation continued to deteriorate. Vietinghoff launched a major counterattack against the Allied beachhead on 13 September, albeit with divisions which were not yet fully reconstituted after the fighting in Sicily. The Hermann Goering and 15th Panzer Grenadier Divisions attacked the British 10 Corps, while elements of the 26th and 29th Panzer Grenadier and the 16th Panzer Divisions drove against VI Corps and the lightly defended area along the Sele River. The Germans penetrated the American lines on the afternoon of 13 September, overrunning a battalion of the 36th Division and threatening the rear of the Allied position. For a time, the situation was so precarious that Clark directed his staff to begin planning to evacuate one of the two beachheads and land its forces on the other. American resistance stiffened along the Calore River as artillery, tank, and tank destroyer units held their ground, pouring shot after shot directly into the attacking Germans. By nightfall the German attacks faltered, and the Allies began to regroup. General Clark had recognized early on 13 September that his position was precarious. Seaborne reinforcements from Sicily could not arrive in time, and British Eighth Army advances were being slowed by heavily damaged roads and logistic problems. Eisenhower had earlier made the 82d Airborne Division available to Fifth Army, and Clark requested its use. The airborne unit represented the only force that could move to the area rapidly enough to make a difference. During the night of 13-14 September, 1,300 soldiers parachuted into the beachhead and immediately moved into defensive positions bolstering the 36th Infantry Division. Throughout the daylight hours of 14 September, the Germans attacked the entire Allied front, searching for weaknesses. Their efforts were unsuccessful. Allied heavy bombers, diverted from attacks on strategic targets in Germany, interdicted German units and supplies flowing toward the beachhead and struck German units in assembly areas and attack positions. Reinforcements also arrived: the British 7th Armoured Division began landing in the 10 Corps sector, and the 180th Infantry, the remaining regiment of the 45th Infantry Division, landed behind VI Corps to become the Fifth Army reserve. That night another 2,100 82d Airborne soldiers landed on the beaches south of Salerno to bolster the defense. By the evening of 14 September, with more supplies ashore and reinforcements arriving, the crisis had passed. miles north of the British 10 Corps on the evening of 14 September to disrupt German resupply and communications lines. The paratroopers had been ordered to harass the Germans for about five days and then either to infiltrate to the beachhead or to link up with advancing forces. Of the 40 planes involved in the operation, only 15 dropped their cargo within 4 miles of the drop zone; 23 planes scattered paratroopers between 8 and 25 miles from the intended target, and the drop site of the remaining 2 planes was unknown. Of the 600 men who jumped, 400 made it safely back to Allied hands several days later after launching small raids in the German rear. Infantry Division, for example, had seen its effective strength reduced to sixty men; the 2d Battalion of the 143d Infantry, which had been in the Sele River corridor, had almost ceased to exist as a unit. Meanwhile, the British Eighth Army continued its advance as the Germans disengaged at Salerno and withdrew north. By 19 September, elements of Montgomery's and Clark's armies met at Auletta, twenty miles east of Eboli. Salerno had been costly for both sides. German casualties were estimated at 3,500. The Americans, who assaulted the beaches under fire more lethal than that encountered in earlier Mediterranean landings, also suffered approximately 3,500 casualties, while British losses were some 5,500. After the battle for the beachhead had ended, the VI Corps received a new commander. General Dawley had not measured up to the expectations of his superiors and Clark was particularly concerned about Dawley's failure to anticipate the threat to VI Corps' weak left flank on 12 September. With the concurrence of Eisenhower, Clark replaced Dawley with Maj. Gen. John P. Lucas on 20 September. tified lines across the Italian peninsula. The Barbara Line, the first defensive belt, was an ill-defined trace of barriers and hastily constructed fortifications along the Volturno River, some twenty-five miles north of Naples. The second belt was through Mignano, fifty miles north of Naples and ninety miles south of Rome, and extending east from the coast to Monte Camino, Monte Maggiore, and Monte Sammucro. This became known as the Bernhard or Reinhard Line. The third defensive belt, twelve miles north of the Bernhard Line and anchored on Monte Cassino and the Garigliano and Rapido Rivers, was called the Gustav Line. Composed of interlocking bunkers and fortifications, it was by far the most formidable of the three lines. The Allies referred to these fortifications collectively as the Winter Line. Kesselring directed Vietinghoff to hold the Allies south of the first line until 15 October to allow adequate preparation of these fortifications. The Allies gathered their strength in anticipation of the attack toward Naples. From 9 September through 1 October, 190,000 troops, 30,000 vehicles, and 120,000 tons of supplies came ashore across the Salerno beach. The remainder of the British 7th Armoured Division, the U.S. 3d Infantry Division, and the last of General Ridgway's 82d Airborne Division disembarked along with the supplies which would facilitate the attack northward. To secure the port of Naples, Clark knew that he would have to move well north of the city after it was captured. 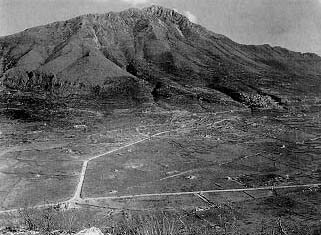 After selecting the Volturno River as the Fifth Army objective, he ordered McCreery's 10 Corps to conduct the main attack up the coast, sweeping around Mount Vesuvius to reach the Naples plain. Lucas' VI Corps was directed to move eastward into the interior, and then wheel northward to protect McCreery's flank. The British 10 Corps' attack toward the two major passes of the Sorrento hill mass began on 23 September and immediately met stiff resistance. Exploiting the rugged terrain, the Germans used a small number of well-chosen strongpoints to slow the numerically superior Allied forces almost to a standstill. In addition, the defenders carried out a scorched-earth policy as they retreated. On one seventeen-mile stretch of road, they destroyed twenty-five major bridges, forcing the Allies to ford a series of rivers and streams against opposition and then build bridges to facilitate the onward flow of reinforcements and supplies. Airborne Division, reinforced by Darby's Rangers, entered the city. Within three days British patrols were at the Volturno River as German forces withdrew behind that natural barrier. By 7 October, the bulk of the British 10 Corps had closed on the Volturno. Lucas' U.S. VI Corps had started its move inland on 20 September in preparation for the northward thrust. Its troops confronted the same problems that bedeviled McCreery's corps. Restricted to narrow roads through steep mountain passes, the Allied routes of advance were crisscrossed by fast-running streams in deep ravines. German engineers had destroyed most of the bridges, and German infantry doggedly defended crossing sites. Often, it was only through the courage and heroism of individual Americans that some semblance of forward momentum was maintained. On 23 September, for example, Cpl. James D. Slaton of the 45th Infantry Division was lead scout of a squad which had been directed to eliminate a German position delaying the advance of his company. Moving ahead of his fellow soldiers, Slaton assaulted the machine gun nest, killing the gunner with his bayonet. Unable to extricate the bayonet, he detached it from his rifle and shot another gunner. Subsequently, he advanced under heavy fire and eliminated two more machine gun positions with grenades and rifle fire, opening the way for his company to advance. For his courageous actions, Corporal Slaton was awarded the Medal of Honor. As the VI Corps continued its slow push northward, small infantry units, operating with little or no artillery and armor support, continued to carry the battle. Mud, rain, and cold became the troops' arch enemies. Units used bulldozers and Bailey bridges to advance in stages. 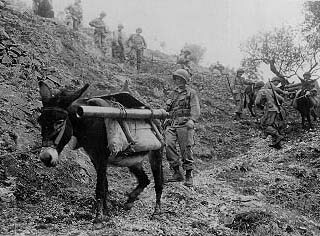 Sure-footed pack mules became the primary resupply vehicle in the rugged terrain. Ultimately, the relentless pressure paid off. By the end of September, the VI Corps had clawed its way through sixty miles of mountains and rugged valleys and occupied the south bank of the Volturno River. Meanwhile, to the east, advancing against only light enemy resistance, Montgomery's forces seized the vital Foggia airfield complex on l October and outflanked German defensive positions by employing a small amphibious raid to seize the port and town of Termoli. On 9 October, Montgomery paused to reorganize and resupply as the Germans occupied defensive positions along the Trigno River. 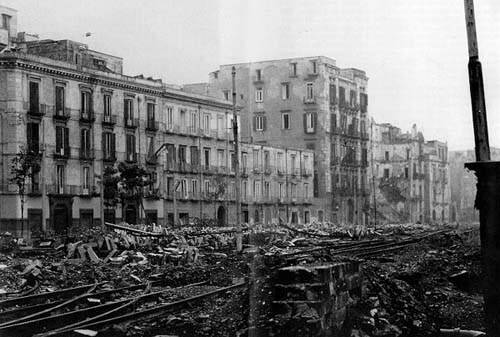 Naples had been a key objective in the Allied plan, its capture was initially disappointing because it had been virtually destroyed. The Allies had bombed and shelled the city, but German demolition teams accounted for most of the damage. Kesselring had been explicit about protecting churches and monasteries, but nothing else was spared. Departing Germans removed or destroyed all communications, transportation, water, and power grids. They burned hotels, mined buildings, collapsed bridges and ripped out railroad tracks. Ships in the harbor were sunk, adding to those already destroyed. To the credit of the Allies, and despite intense German air raids, the port of Naples was reopened to traffic within a week of its capture. By the end of October, nearly 7,000 tons of supplies were flowing ashore daily, almost at the prewar level. However, much rebuilding remained to be done, and nearly 800,000 Neapolitans depended upon the Allies for basic survival items for many months. With Naples secure, the Allies turned their attention to the north. In early October it appeared to Allied planners that the Germans would withdraw slowly north, perhaps pausing on good, defensible terrain south of Rome, to gain time to complete fortification of their main defensive line in the Pisa-Rimini area. This course of action would shorten German lines of communications and eliminate the threat of an Allied flank attack, now possible because of the German withdrawal from Sardinia and Corsica in September and early October. The advance of Allied forces to the Pisa-Rimini line would gain additional airfields near Rome and provide security for all Allied airfields in central and southern Italy. However, an advance to northern Italy might be difficult, particularly if the Germans chose to defend south of Rome. Moreover, in accordance with earlier agreements, four American and three British battle-tested divisions were withdrawn from the Mediterranean theater to participate in the cross-Channel invasion of France. Concurrently, an invasion of southern France was being planned which would require additional troops from Italy. Alexander's 15th Army Group could no longer count on significant reinforcements or massive air support as it attempted a push toward Rome and beyond. General Clark ordered a general assault on the Volturno line for 13 and 14 October. Initially, Fifth Army attacked with two corps abreast, each employing three divisions. The Allies encountered strong resistance and purchased each inch of progress with blood. A feint executed by the U.S. 3d Infantry Division on VI Corps' left flank deceived the Germans and contributed to Lucas' success. The British 56th Division, repulsed in its zone, attacked through the 3d Infantry Division sector and joined the British 7th Armoured Division, the Desert Rats of North Africa fame, and the U.S. 46th Infantry Division north of the river. To the east, Montgomery's attacks also proved successful. But Vietinghoff had held the Volturno River line until 15 October as ordered. He directed his soldiers to conduct a fighting delay northward to the Barbara Line where the next major battles with the Allies would take place. ducted an assault on the position, the Allies frequently would find that the Germans had melted away. With the roadblock reduced or the ford secured, the units would resume their forward progress, perhaps to be halted only a few hundred yards farther on by another obstacle. In twenty days during October across a forty-mile front, Fifth Army forces advanced only between fifteen and twenty miles. However, the Allies finally breached the vague and ill-defined Barbara Line. In the interim, German forces had laid 45,000 mines in the Bernhard Line, and another 30,000 mines on its approaches. By the end of October, Rome was still a long way off. The month-long struggle by the Allies as they advanced from the Volturno River to the Bernhard Line brought both Fifth and Eighth Armies near the point of exhaustion. The Allies had pressed the Germans continuously, maintaining the momentum of the attack. But with the drawdown for OVERLORD, neither Clark nor Montgomery had the option of pulling units out of the line for rest and rehabilitation. Although Italy had declared war on Germany as a cobelligerent, its contributions to the fighting would be minimal. Additional reinforcements would not arrive until December and January. On 15 November, succumbing to both weather and fatigue, Clark received approval to halt Fifth Army's progress for two weeks to enable his soldiers to rest, refit, and regroup. pressure on the Germans to keep them from diverting forces to France or Russia without requiring significant Allied reinforcements of men or supplies. The Americans, however, were wary of continued British proposals to attack Germany proper through the Alps or to expand the Mediterranean theater into the Balkans or the Aegean. The Germans also were reevaluating their commitment to and command structure in Italy even as the Allies debated the date for OVERLORD. Hitler had considered placing Rommel in overall command of German forces in Italy but instead selected Kesselring, who believed that a defense south of Rome was feasible. Hitler transferred Rommel to France and elevated Kesselring to supreme commander in Italy and commander of Army Group C. Kesselring quickly confirmed his strategy of holding Italy south of Rome. On the Allied side, events were in motion to break the stalemate that had slowed the Allied advance through mid-November. In early October, Clark had established an amphibious task force to find alternatives to the agonizingly slow and costly mountain warfare. On 8 November Eisenhower, still in command of the Mediterranean theater, decided on a two-pronged attack on Rome. While Montgomery's and Clark's armies attacked the Winter Line, Clark's VI Corps would conduct an amphibious assault at Anzio, south of Rome and some forty-five miles behind the Gustav Line. The Combined Chiefs of Staff approved Eisenhower's request to keep sixty-eight LSTs (landing ship, tanks) in the Mediterranean to support this assault but directed him to release them by the end of January 1944 so that they would be available for OVERLORD. The Fifth Army's interim goal between mid-November and mid-January was to continue moving north and prepare to link up with the Anzio beachhead once it had been established. The arrival of these units eventually would allow VI Corps to be pulled out of the line for the Anzio landings. Two additional, green U.S. divisions, to replace those pulled from the Mediterranean for OVERLORD, would not arrive until January. Allied combat power was not simply a product of the sheer number of divisions. It stemmed from the numerical strength those divisions and their combat support and combat service support units, augmented by substantial tactical air support and an efficient multiservice resupply effort. Fortunately for the Germans, the rugged terrain, and now the winter weather, would favor the defense. The Allied offensive in Italy resumed on 20 November when Montgomery attacked the Winter Line with three divisions. 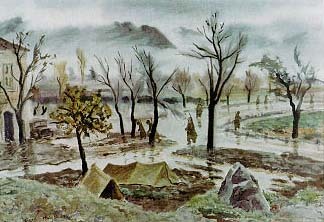 Torrential rains stalled the assault for a week. By 2 December Eighth Army was again on the move, but both weather and German resistance slowed its progress. Supply movement became increasingly difficult as roads and Hails turned to mud. Tanks bogged down and casualties mounted. On 27 December Montgomery halted well short of the objectives. Two days later, he left for England to assume command of the British and Canadian forces scheduled to land in Normandy and was replaced by Lt. Gen. Sir Oliver Leese. The Fifth Army assault met equally stiff resistance. To the east, VI Corps launched probing attacks on 29 November and subsequently attacked Monte Pantano and the surrounding high ground. In the west, the British 10 Corps, already along the Garigliano River near the coast, initiated demonstrations on 1 December to draw German forces toward the coast and then attacked toward Monte Camino. On the night of 2-3 December, II Corps attacked in the center of the Fifth Army sector and captured Monte Camino, but required another week to clear it completely of Germans, who directed a number of savage counterattacks at the advancing forces. As a result of slow progress and limited reinforcements and shipping, the Allies shelved the Anzio invasion plans. entire mountain. German forces in San Pietro held out for over a week in some of the fiercest and bloodiest fighting of the campaign. Repetitive Allied assaults, including a two-pronged tank-led attack during which most of the armored vehicles were destroyed, incurred heavy losses. Finally, on 16 December, to prevent envelopment following an American surprise attack that had seized Monte Lungo, the Germans abandoned San Pietro and withdrew to Monte Porchia and the village of San Vittore. But the Allied success had been costly. The battle for San Pietro had cost the 36th Infantry Division i50 killed, 800 wounded, and 250 missing; casualties for supporting airborne, Ranger, and tank units were also high. 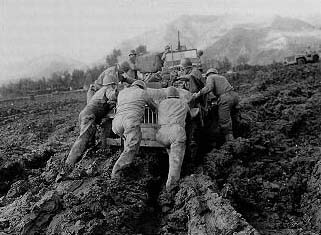 Meanwhile, to the east, VI Corps continued its attacks, seizing hills and ridges often at heavy costs in terms of casualties and nonbattle injuries. Finally, a year-end blizzard gave the weary Fifth Army soldiers some respite from combat, but the New Year held little hope for improved conditions. January brought significant changes in the Allied command structure. As scheduled, British General Sir Henry Maitland Wilson became Supreme Allied Commander of the Mediterranean theater, replacing Eisenhower. U.S. Lt. Gen. Jacob L. Devers became his deputy. With the British assumption of primacy in the theater, Churchill's desire to press toward Rome took on new life. Plans for the amphibious landing at Anzio were dusted off and D-day was set for late January. Fifth Army directed VI Corps to assault Anzio with two divisions. The operation would have only minimal supplies and a thin resupply line because of the lack of adequate amphibious shipping available in the theater. However, Clark was enthusiastic about the plan, which would facilitate his drive to Rome. But to relieve the beachhead, Fifth Army had the formidable task of reaching and then assaulting across the Garigliano and Rapido Rivers, rupturing the Gustav Line, and breaking through its defenders. west, Germans opposing the British 10 Corps held out until 8 January, then withdrew to prevent being trapped. Fifth Army continued to press the attack, and a final assault on 14 January met only limited resistance. The Germans had withdrawn behind the Rapido River the previous night. The Fifth Army had broken the Bernhard Line, but the formidable Gustav Line defenses and Rome lay ahead. Although the British 10 Corps had expanded its bridgehead to a width of ten miles by 20 January, it failed to reach its objectives. Significantly, the Germans repulsed the British 46th Division attack adjacent to the U.S. II Corps area, leaving the Americans with an exposed flank for their forthcoming assault. Faced with fresh German forces, British 10 Corps efforts bogged down and would make little progress for the rest of the month. In the center, Clark had directed II Corps to conduct the main attack along Highway 6 west of Monte Cassino. The Americans were to cross the Rapido River, penetrate the Gustav Line, and allow the 1st Armored Division to pass through into the Liri valley, which was the key to Anzio and Rome. Walker's 36th Infantry Division was to lead the assault. However neither Walker nor his corps commander, General Keyes, was optimistic. The swiftly flowing Rapido River was twenty-five to fifty feet wide, with steep banks. The Germans had diverted the river upstream from the assault area, making the approaches a sea of mud. From the heights of Monte Cassino and Sant'Angelo, the Germans could observe and bring fire on the entire area. Additionally, amphibious vehicles, originally planned for the river crossing, had been diverted to VI Corps to replace vehicles lost in practice exercises for Anzio. The crossing would rely on rubber and wooden assault boats provided by Army engineers. Because of swampy banks and heavy German fire, the boats were positioned several miles from the river and had to be carried forward by the infancy just prior to the attack. Nevertheless, despite many problems and against the alternative suggestions of his subordinates, Clark insisted that the II Corps attack proceed on schedule. The 36th Infantry Division, with two regiments abreast, attacked on the evening of 20 January. In the 141st Infantry sector, enemy fire destroyed many of the assault boats before they reached the river, where the swift current and accurate German artillery fire hampered efforts to construct bridges. Despite extensive land mines, lost guides, and withering enemy fire, some 100 Americans managed to cross the river before German artillery destroyed the last ponton bridge. With dawn rapidly approaching, and unable to reinforce his forward forces during daylight, the regimental commander halted the attack and directed those soldiers in the bridgehead to dig in and await help. men to the relative safety of the near bank before they were cut off. But the 36th Infantry Division attack was obviously a dismal failure. Despite these setbacks, Clark and Keyes instructed Walker to resume the attack. Unfortunately, the efforts of the 143d Infantry late in the afternoon of 21 January mirrored those of the previous day. Approximately 250 soldiers reached the far bank of the river, but mines, artillery, and intense enemy fire prevented reinforcement. More boats were damaged and bridges destroyed by German artillery. Fog and smoke prevented Fifth Army artillery from effectively engaging enemy positions. By the afternoon of 22 January, elements of the three battalions of the 143d on the German side of the river were withdrawn. Meanwhile the 141st Infantry had again assaulted across the Rapido at 2100 on 21 January. It found no survivors of the bridgehead that had been established the previous evening. As with the attack the day before, the 141st came under heavy and effective German fire and counterattacks. During the next day bridges and boats were destroyed, communications were cut, and by evening all the officers in the bridgehead except one were casualties. With the bridges destroyed or swept away and all the boats out of action, Walker could do little to help his trapped soldiers. By late evening, all resistance on the far bank ceased. Except for some forty men who swam back across the river, the entire assault force was either killed or captured. draw from the war. All agreed that bases in Italy would provide support for the air war against German sources of supply in the Balkans and the German industrial heartland itself. These sound strategic goals were valid in 1943 and have stood the test of time. By late August, the Italian government had decided to withdraw from the war and break relations with Germany. The fall of Sicily had enhanced Allied control of the Mediterranean but had not assured it. Prior to the invasion of Italy, therefore, the Allied goals were far from being totally satisfied, and an eager world watched as the Allies launched first BAYTOWN and then AVALANCHE to invade the European continent. The success of BAYTOWN never seemed to be in doubt. 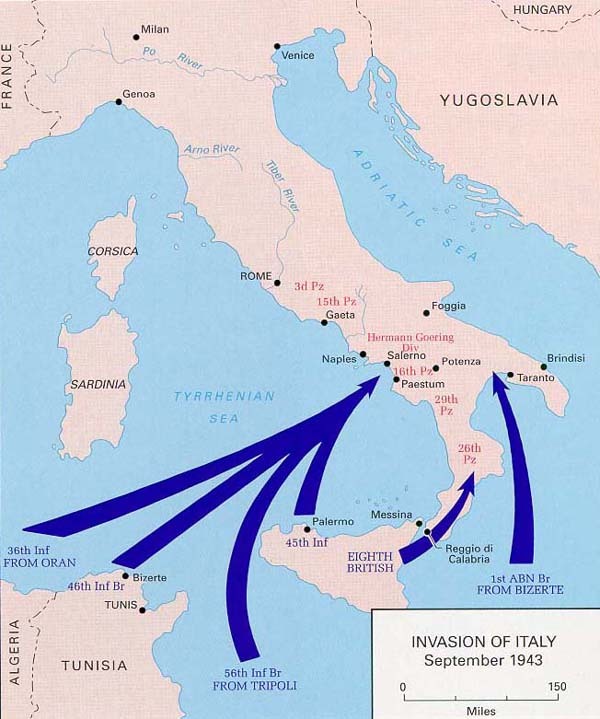 Supported by a secure chain of supply, and capitalizing on German withdrawals, Eighth Army slowly cleared the toe of the Italian boot and by 14 September was moving up the Italian east coast. The Salerno landing, in conjunction with the Italian capitulation, drew German forces northward away from Eighth Army. The fate of AVALANCHE was much less assured. The operation lacked adequate amphibious shipping, and the forces landed at Salerno were insufficient to hold the extensive beachhead. Montgomery's failure to advance north as rapidly as expected further jeopardized the thrust. Fortunately, the German units defending the area were not fully reconstituted from their fighting in Sicily. Only the inability of German commanders effectively to muster and direct their forces allowed Clark time to reinforce the beachhead. The fact that he seriously considered evacuation of part of the beachhead indicates the gravity of the situation. The AVALANCHE force could have been thrown into the sea. Thanks to extremely effective naval and aviation support, quickly deployed airborne reinforcements, the courage and capability of Allied soldiers, and quite a bit of luck, the beachhead survived. Allied effort in Italy had become a land campaign of minor strategic importance in a secondary theater of operations. With the benefit of hindsight, some have questioned whether a continuation of an offensive campaign to gain the Rome airfields and provide security for the airfields in central and southern Italy was appropriate. The cost of the Rapido crossing, and the Anzio invasion which it supported, must be weighed against the limited strategic gains. No one can question the courage, capability, and tenacity of the Allied soldiers who fought in Italy. In retrospect, greater cooperation and coordination between British and American leaders, a more realistic appraisal of the strategic value of the campaign once control of southern Italy was gained, and a better meshing of resources and missions at the tactical level would have enhanced the effectiveness and decreased the human cost of the Naples-Foggia Campaign. There are a number of works available on the World War II Mediterranean Theater of Operations for those who wish to learn more about wartime operations there. Strategic Planning for Coalition Warfare, 1943-1944 (1959), by Maurice Matloff and Salerno to Cassino (1969) by Martin Blumenson, both published in Washington, D.C., by the U.S. Army Center of Military History, are seminal works. Salerno: American Operations from the Beaches to the Volturno, 9 September-6 October 1943, published in Washington, D.C., by the Military Intelligence Division of the War Department in 1944 (and republished in paperback by the Center of Military History in 1990) provides a contemporary view of the amphibious invasion. Another account of the Salerno operation is Eric Morris, Salerno: A Military Fiasco (1983). Samuel Eliot Morison provides highlights from a Navy perspective of the Salerno and Anzio invasions in volume 5 of his History of United States Navy Operations in World War II series, titled Sicily, Salerno, Anzio, January 1943-June 1944 (1954). Martin Blumenson, Mark Clark (1985), provides the Fifth Army commander's view of the campaign. Finally, a 1990 addition to the Major Battles and Campaigns Series edited by John Eisenhower is Carlo D'Este, World War II in the Mediterranean, 1942-1945.